Creates a broad robust flavor that compliments all meats, unparalleled with fish and seafood. Manuka Woodchips Australia are proud to announce that we are importing Genuine Chemical Free New Zealand Manuka Wood Chips into Australia. Our gold award winning woodchips are now available and due to overwhelming demand, we are excited to announce Manuka Woodchips have partnered with Manuka2U Pty Ltd who are now our National Wholesale channel for our Wood Smoking Chips. Manuka2U is a family run company based in the Brisbane area, and they carry the same passion and focus on customer service as we do. Most importantly we all believe that Genuine New Zealand Manuka Wood Chip is “the chip of choice”. 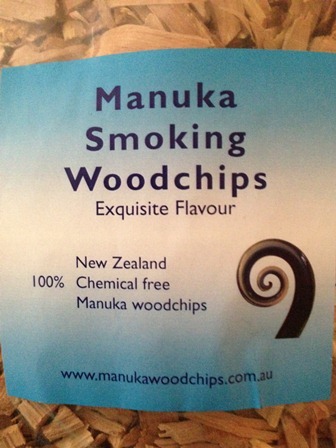 All of our Manuka Smoking Woodchips are processed in New Zealand and imported into Australia. No chemicals are used in the preparation of our Manuka Smoking Woodchips. Manuka Smoking Woodchips are processed from Manuka trees on the West Coast of New Zealand. Manuka Smoking Woodchips have produced some of New Zealand's award winning ham, chicken and eel products which are exported to Japan. Can be used for either hot or cold smoking. Can be used in a smoker, bbq, or a frypan with a rack.